MG Plate Rolls vs the Need of Special Alloy Rolls | C Marshall Fabrication Machinery, Inc.
Special alloy rolls are necessary when there is a need to roll a relatively tight diameter on a machine where the standard roll is too large. The question is, however, should you really choose a special alloy roll or should you consider an option that gives you the benefits of the alloy roll but doesn’t limit the usage of your machine? 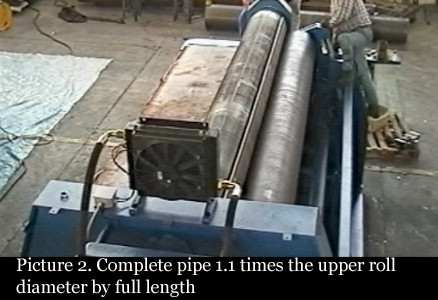 For an example, a 10’ X 3/8” roll should be used with a 10” roll diameter. Let’s say a person is looking for a roll of this size but has a requirement of rolling 13” diameters. He would have to by a smaller machine unless the power requirements called for the 10’ X 3/8” and in that case he would need a machine with a reduced diameter top roll. This roll would have to be a special alloy roll because it would be smaller yet still being able to do the work of a roll with more mass. Once you have made the decision to use a smaller special alloy roll you have turned your machine into a very narrow usage machine. A special alloy roll can take more deflection without taking a set (warping) and still go back to it original position. However, a special allow roll still has the same characteristics as any other roll. If it has less mass it will deflect more. So, having a smaller roll – even a special alloy roll – will mean you cannot do the range of work you could with the standard diameter roll. You will have severe barrel defects if you work anything beyond the mid-range of the machine. For this reason it is always better to bring the most massive roll to what ever job you are doing. MG rolls are capable of working to 1.1 times the top roll diameter at about 60% of its capacity by full length. 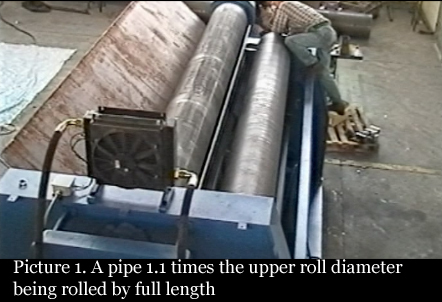 Almost all other machines can only work to 1.4 or 1.5 times the top roll diameter by full length. Example: a MG plate roll and a competitor’s plate roll; both with 10” diameter top rolls. If a job requires a 13” diameter the competit or would have to quote a smaller machine or a 10’ X 3/8” machine with a smaller special alloy roll. MG roll, however, would be able to roll the part with no problem even if the job called out for an 11” diameter. It does this with the full 10” diameter without having to reduce the roll to an 8.6” diameter and reducing the effectiveness of the roll. The reason why MG rolls can work up to 1.1 times the top roll diameter is their exclusive geometry. It is not a matter of power at all. In fact, MG’s geometry allows it to use less power for any given job making it the most energy-efficient roll on the market. MG rolls also use less horse power than the competitor. If you are looking for a bigger machine to make a smaller diameter you can always choose a special alloy roll; however, if you want to get a smaller diameter part without sacrificing a broader range of rolling, your best choice is the MG roll.